If humans were meant to stay in one place, we'd have roots instead of feet — so make like a tree and leave to Twin Waters! 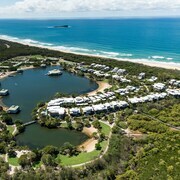 25 kilometres from the heart of Sunshine Coast, lastminute.com.au has a hotel to suit your style, whether you're keen to splash some cash or keep things low-key. For some place cool to spend the day, take a trip to Red Jacket Aqua Fun Park, a place where you and the kiddies can play and frolic in the water. You'll find a couple of hotels not too far away. 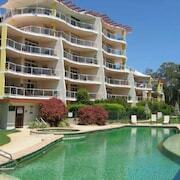 The Aqua Vista Resort and The Sebel Twin Waters are super spots to catch some Zs. If you've got some pennies for a rainy day, visit Sunshine Plaza to purchase everything you need as well as a few luxuries! 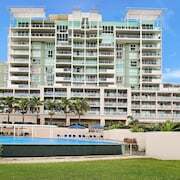 You can throw down your suitcase and get some shut-eye at the Oceans Mooloolaba and Alexandra on the Pacific if you're thinking of visiting this sight. 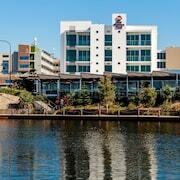 The Novotel Twin Waters Resort is where to book if you're prepared to splash a little more. Go on, indulge a bit (we won't tell anyone — promise). Want to soak up the café culture? Get out your laptop, order a hot coffee and spoil yourself with some sweet treats at Twin Waters Takeaway and Cafe. When your tum seriously starts to kick off, toddle on over to THE DELI CAFE and take a look at their impressive menu. Now you've warmed up, we're guessing you wouldn't say no to a couple of beers or a bottle of wine at The Loose Goose. It's a great place to debrief after a day of adventures. 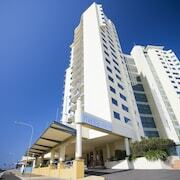 Can't secure the right Twin Waters hotel? 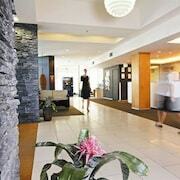 Don't tear your hair out — there are heaps of options in Pacific Paradise and Sunshine Coast Airport. So, what are you waiting for? Whether you're looking for a cheeky long weekend away with the squad or a full-blown spiritual odyssey, we're here to make it happen.